Mixed materials of shake, brick and metal roofing give this Craftsman home undeniable curb appeal. Twin sets of columns welcome visitors to the front porch in a friendly yet elegant manner. The interior boasts equal appeal, with its comfortable but spacious layout. A 12-foot foyer provides luxury when walking through the front door. Just off the foyer is the spectacular great room. With porch access, built-in shelves, a fireplace and tray ceiling, the great room is the ideal space to entertain. The kitchen's wraparound countertop doubles as a serving bar and provides plenty of space for food prep. A bay window hugs the breakfast room allowing light to brighten the room from all directions. The master bedroom invites its homeowners to truly relax, with two walk-in closets and a luxurious master bath. Note the bonus room above the garage, perfect for a media room or a child's playroom. 1st Floor: 2289 Sq. Ft. 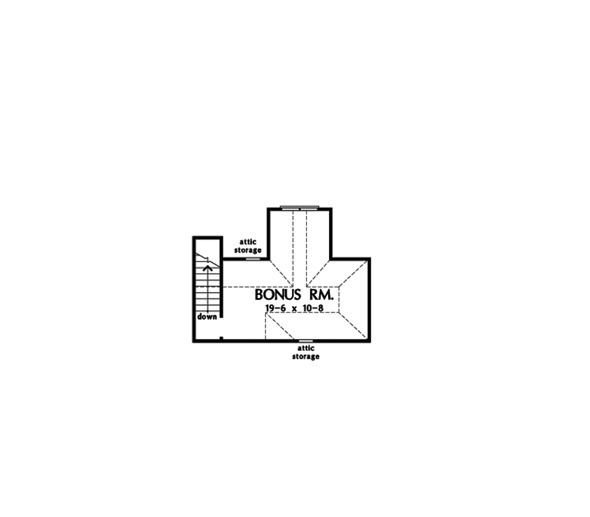 Bonus Room: 283 Sq. Ft.
House Dimensions: 83' 4" x 53' 8"
Great Room: 19' 0" x 16' 8"
Master Bedroom: 14' 8" x 14' 6"
Storage (1st Fl.) (Sloped): 3' 4" x 2' 6" x 0' 0"
Utility Room : 8' 0" x 11' 8" x 9' 0"
Bedroom #2 : 12' 8" x 11' 8" x 9' 0"
Bedroom #3 : 11' 4" x 12' 0" x 12' 0"
Bonus Room : 19' 6" x 10' 8" x 8' 0"
Breakfast Room : 10' 4" x 8' 0" x 12' 0"
Dining Room (Tray): 11' 4" x 13' 8" x 13' 5"
Foyer : 7' 4" x 13' 8" x 12' 0"
Great Room (Tray): 19' 0" x 16' 8" x 15' 0"
Kitchen : 14' 0" x 14' 0" x 12' 0"
Master Bedroom (Tray): 14' 8" x 14' 6" x 10' 6"
Porch - Rear : 32' 11" x 10' 2" x 0' 0"
Porch - Front : 20' 0" x 3' 10" x 11' 0"
Porch - Right : 3' 11" x 12' 0" x 9' 0"